LAS VEGAS, Nev. — Vice President Mike Pence rejected the suggestion that there is a link between the kind of political rhetoric used by President Donald Trump and acts of violence like Saturday's deadly shooting at a synagogue in Pittsburgh or last week's mail bombs sent to prominent Trump critics. 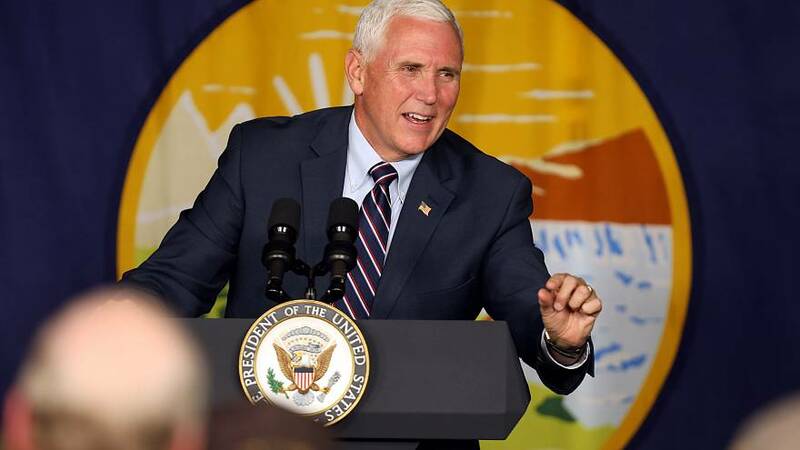 "Everyone has their own style, and frankly, people on both sides of the aisle use strong language about our political differences," Pence said in an interview with NBC News. "But I just don't think you can connect it to acts or threats of violence." The vice president called for "unity" earlier in the day at a campaign event in Las Vegas. "What happened this morning in Pittsburgh was not just a criminal act, it was evil," he told NBC News. He added that the administration is "absolutely determined to do everything in our power to prevent these types of attacks from happening in the future." But when asked about calling Democrats a "mob," as he did at campaign stops a day before, Pence indicated that was part of political debate. "The American people believe in the freedom of speech," Pence said. "And throughout the history of this country we've always had vigorous debates and then we settle those debates in the ballot box. We don't settle them through acts or threats of violence like the pipe bombs we saw sent to the Obamas, the Clintons, to CNN and others." And he characterized the president's penchant for name calling as part of the reason Trump has effectively connected with a large contingency of the country. "The president and I have different styles, but the president connected to the American people because he spoke plainly." When asked if the president's rhetoric is "healthy" for the country's civil discourse, the vice president said "debate is healthy in America," and, again, dismissed any connection between "the kind of violent behavior we witnessed in Pittsburgh" to "the political debate."